More than 12 million immigrants entered the U.S. through Ellis Island in New York Harbor. Between 1892 and 1954, individuals determined to build a new life in the U.S. crossed the Atlantic Ocean on crowded ships, hoping to be admitted after a six-second physical examination and two minutes spent answering 29 questions about their names, last residences, religions, occupations, family ties to the U.S. and the amount of money they carried. Family and friends sometimes awaited new immigrants at The Kissing Post, a wooden column outside The Registry Room. Most immigrants (98 percent of them) departed Ellis Island and ventured into the U.S., landing card in hand, within four hours of walking beneath the 60-foot vaulted ceilings of the Great Hall in the port's main building. Construction of the first main building was completed in 1892. It was built of wood and operated for five years until it burned down, taking years of immigration records with it. The replacement building was constructed from red brick and limestone in the Beaux-Arts style (designed using the neoclassical architecture style taught at the Ècole des Beaux-Arts in Paris)—its architects won a gold medal at the 1900 Paris Exposition for building design and construction. Like the Statute of Liberty, Ellis Island's main building is a French-inspired symbol of the U.S. There are some lovely photos of the architecture on nyc-architecture.com. Only a third of immigrants admitted to the U.S. at Ellis Island remained in New York. The rest scattered across the country, so that 40 percent of current U.S. citizens trace their family histories back to the island. The entire island was abandoned and fell into disrepair after Ellis Island closed in 1954, but just more than 10 years later, it was recognized as a national treasure: in 1966, Ellis island was officially made part of Statue of Liberty National Monument and listed on the National Register of Historic Places. The early years of Ellis Island's 62 years of operation, along with its main building on the island's north side, are the time and place that most closely resemble the ideal the nation treasures: a time and place where just about any person was simply welcomed into the safety, protection and opportunity of the U.S. The peak year for immigration at Ellis Island was its fifteenth year, 1907, when the immigration station processed more than 1 million immigrants. The main building was renovated and reopened in 1990. Today, it houses three theatres featuring films and live performances, as well as immigration exhibits. Outside the building, the Wall of Honor lists names of some immigrants processed at the entry port. The south side of the island, on the other hand, has been long considered a symbol of the darker side of the Ellis Island story, and its preservation hasn't fared so well. Known as the "Sad Side," it remains closed to the public. 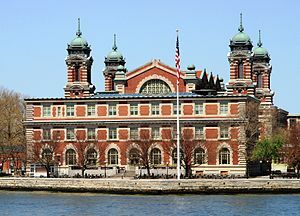 During Ellis Island's tenth year of operation, the Ellis Island Immigrant Hospital opened in 1902 on the island's south side and was operated by the U.S. military until its closure in 1930. The south side houses a medical complex with corridors connecting 29 buildings including the hospital, laboratories, isolation rooms, contagious-disease wards, an autopsy amphitheater and a morgue. In contrast to the Ellis Island main building being a symbol of hope, the hospital complex calls to mind why the island has also been referred to as "The Isle of Tears" and "Heartbreak Island." Two percent of arrivals at Ellis were not admitted to the U.S. after crossing the ocean with hopes so big or conditions at home so bad. They were deemed to be dangerous or likely require government money to survive: those with a chronic or contagious disease, criminal background, mental health issues, or who were unskilled. Doctors chalked codes onto the clothes of would-be immigrants who might be sick, indicating that the hopefuls were to be detained for more thorough examination. Individuals deemed sick were either sent home or to the island hospital. "The famous words of Emma Lazarus on the pedestal of the Statue of Liberty read: 'Give me your tired, your poor, your huddled masses yearning to breathe free.' Until 1921 this was an accurate picture of our society. Under present law it would be appropriate to add: 'as long as they come from Northern Europe, are not too tired or too poor or slightly ill, never stole a loaf of bread, never joined any questionable organization, and can document their activities for the past two years.' Furthermore, the national origins quota system has strong overtones of an indefensible racial preference. It is strongly weighted toward so-called Anglo-Saxons." A further complication with the south side image is that the hospital's military administration blends with another bleak aspect of Ellis Island's history. When World War II happened, while still admitting some immigrants, instead of continuing its use primarily as a port of entry, from 1941 through 1948 the U.S. government used the island as a war-related detention facility for people who were originally from Germany, Italy and Japan, including U.S. residents and their citizen children. The Ellis Island Immigration Museum timeline documents that approximately 7,000 captives were being held at Ellis Island in 1946. Seven years after the war ended, in 1952, the Immigration and Nationality Act codified all U.S. immigration rules and got rid of a rule that disallowed people from Japan, Korea and other East Asian countries from becoming U.S. citizens. Two years later, Ellis Island closed. So, the hospital complex is the sad side of things. The un-renovated south side buildings suffered further damage during Superstorm Sandy in 2012, but the hospital and administration buildings have now been stabilized, and stabilization of the contagious disease wards is presently underway, according to the non-profit Save Ellis Island, which presents intriguing photos, written accounts and program descriptions to advocate for better preservation of the south side. Hopefully, we can discover ways to accept the bad with the good and find value in better preserving the whole of Ellis Island. The Island itself is 27.5 acres in Upper New York Bay and is partly of natural composition, but mostly manmade of land removed from New York's underground during the construction of subway tunnels in 1890, as well as from incoming ships' ballast (sand, gravel, iron or lead carried low inside the ship to improve their stability on the water). Through legal disputes between the states of New York and New Jersey, since 1998 it's been settled by the U.S. Supreme Court that the 3-acre natural portion of the island is within New York, and the remaining landfill portion is part of New Jersey. Avoid lines and save time by purchasing your ferry ticket, departing from Battery Park in New York or from Liberty State Park in New Jersey, to Ellis Island online before you go. According to one happy visitor, Ellis Island's Great Hall is restored to look as it did during its heyday, and visiting crowds bring the immigrants' experience back to life. You can see items left by new arrivals, a film, theatre performances and charts. Search databases for free, and pay a fee for more detailed searches that produce framing-quality reproductions of the handwritten manifest and photo of the ship your ancestor arrived on. They say the skyline view is magnificent. Begin searching for your relative's passenger records before you go through the National Archives and Records Administration at Archives.gov, a paying service like Ancestry.com, or for free at EllisIsland.org. Of course, there seem to be more advanced search options using a private service. For Ellis Island facility information, including operating seasons and hours, directions, fees, reservations and filming and other permits, visit the National Park Service online. For planning entertainment while you're at the island, you may want to visit TheStatueofLiberty.com, which provides information about group planning, what to expect, food service and special events (all set to audio recordings of period music and immigrants talking about their experiences at Ellis Island). Before Ellis Island opened in 1892, the state and city of New York had been welcoming and processing new arrivals since in 1820 at Castle Garden Immigration Depot in lower Manhattan. More than 100 million U.S. citizens trace their ancestry through the Castle Garden experience. For more information, visit CastleGarden.org, which provides free access to a database of information about 11 million immigrants who entered the U.S. between 1820 and Ellis' Island's opening.